While strolling through the Farmers’ Market near our condo, I spotted a bronzed pineapple. I asked the clerk what it was and he told me Brazilian Pineapple, a fresh pineapple sprinkled with honey & cayenne pepper and then broiled. After you broil it, stick in some colorful toothpicks and serve warm or room temperature. Right before Valentine’s Day I had a few friends at our apartment and made my own version of this spicy dish. Since that holiday seems to inspire “hot & spicy” foods such as chili, I thought a fruit dish would make a nice spicy hors d’oeuvre, and it did! 3. 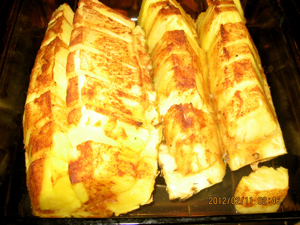 Place “dressed & spiced” pineapple on a cookie sheet or baking pan and bake for about 8- 10minutes. Then switch to broil and broil for about 2 minutes. Remove, place on a serving platter with colorful toothpicks in the slices, and serve warm. 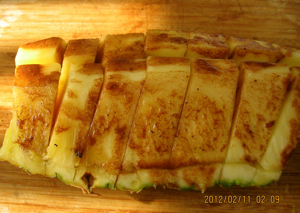 (Top photo is the broiled pineapple.) Sweet & spicy at the same time! 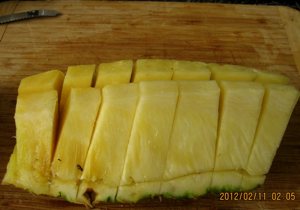 Yield: Enough for a small crowd or two people who love pineapple! When I purchased the pineapple, the clerk at the produce stand told me to cut off the top of the ripe pineapple and turn it upside down to allow the sweetness that settles on the bottom to move to the top. I used a large measuring cup to suspend the pineapple earlier in the day & let it sit upside down for a few hours. It was sweet, but maybe this is a trick to make it sweeter. This entry was posted on Tuesday, February 28th, 2012 at 8:25 am	and is filed under Kitchen Nutrition. You can follow any responses to this entry through the RSS 2.0 feed. You can skip to the end and leave a response. Pinging is currently not allowed. Not only your receipes but also your pictures are so inviting. PS: My friend, Sharon Adelman, is very much interested in your blog and I am forwarding this to her.